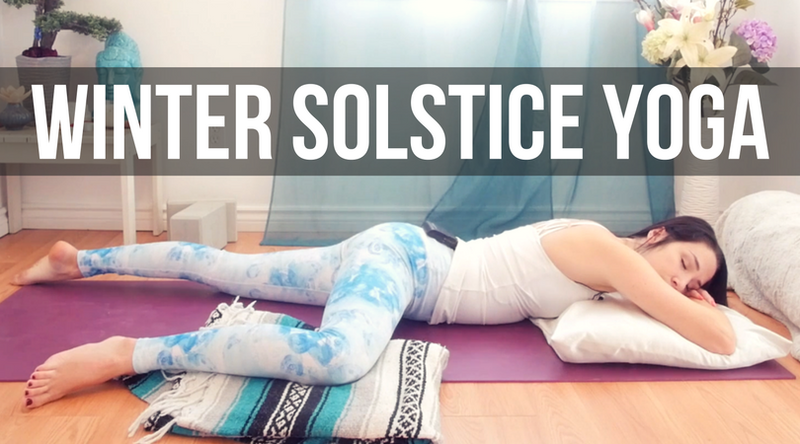 Namaste yogis and happy winter solstice! This is a special time of the year that I feel many people misunderstand. The Winter solstice is a paradox. It marks the longest night of the year as well as the return of sunlight as we move towards Spring. The last thing we want to do during the Winter solstice is overexert ourselves! This time of the year is all about resting, saying no, sleeping and tuning in to what we truly want. A flower is not meant to blossom year round and we aren't either. Winter is a time for us to hibernate physically, mentally and emotionally. While we can't actually sleep for months, Winter is a beautiful opportunity to reduce the amount of activities, tasks and stresses you normally have. The magical thing about honoring winter by slowing down and resting more is that it will make you more productive and full of energy come Spring and Summer! We burn out when we try to GO GO GO year-round... It isn't sustainable! In this restorative yoga practice I'll ask you to stop trying to do everything and learn to do nothing. Restorative yoga is not about chasing sensation but about restoring yourself to optimal health and soothing the nervous system. The winter solstice is a time of darkness and death which are necessary so that we may be reborn in the springtime with fresh ideas and new perspectives. Have plenty of props around you like pillows, bolsters,blankets and blocks and keep a journal close by. You'll be prompted to dream, visualize and imagine what you want your life to be like. This is such a wonderful time of the year and I really hope you'll make the most of it by doing WAY LESS. Take some bubble baths, sleep more, eat more and learn to say NO.